Tatiana Miller leads a conga line of Mark Miller Subaru staffers. Three years ago, Tatiana Miller went into a Crown Burgers outlet near Salt Lake City looking for a bite to eat. That's where she ran into Stauss Paulos, a 22-year-old assistant manager of the restaurant. The meeting was fortuitous for both. Miller, who is assistant general manager of two Mark Miller Subaru dealerships and runs an affiliated lending company with her husband, is always on the lookout for young, well-educated employees to bring into the businesses. And Paulos, a University of Utah graduate, is now working for the Millers' lending company, JCO Financial. He's among the roughly 30 percent of Mark Miller Subaru and JCO Financial's 180 employees who are age 30 or younger. "He's a portfolio manager at a subprime lending company with a prime portfolio," Miller says of Paulos, now 25, who joined JCO in 2013. Paulos has "maybe five late loans out of a $1.65 million portfolio, and they're less than 30 days late," she says. Mark Miller Subaru's South Towne, shown, and Midtown stores have millennial employees in sales, marketing, service and other departments. For three years, Miller says, she and her husband, Jeff, have made a concerted effort to recruit young, college-educated employees without automotive experience to staff their two Subaru dealerships and finance company. That effort includes not just making the most of chance encounters, but staying connected with local colleges to develop a pipeline of interns and prospective hires. These millennials work in sales, marketing, service and other departments. 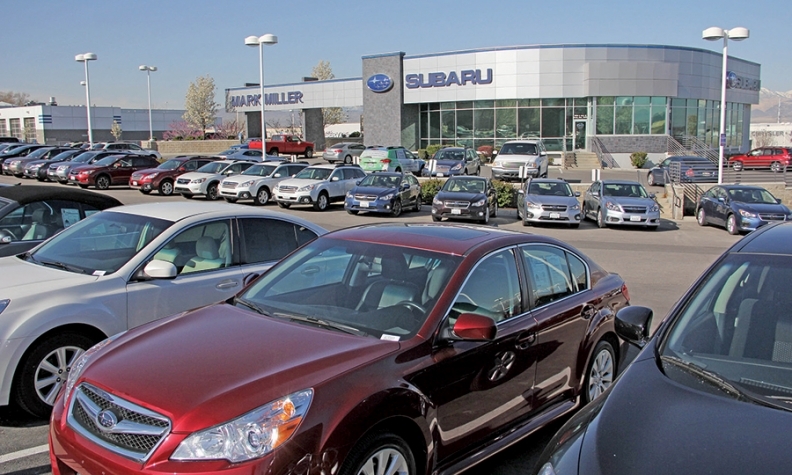 And the Millers say the young workers' presence has changed the businesses in many ways: Turnover in entry-level jobs is down, health care costs are lower and the youthful mindset of the dealerships helps cater to Subaru's shopper base. "Subaru customers are intelligent," Tatiana Miller says. "They tend to have a college degree or higher. They've already done their research. They want somebody to listen to them and not to push them in one direction or another." For many dealerships, it's hard to attract such workers, let alone keep them motivated to stay. So the Millers, who both hold master's degrees from the University of Utah, maintain relationships within the university's business school to keep tabs on potential hires. The dealerships also offer internship programs for undergraduate students at the University of Utah and other local colleges. Josh Goldsmith, a 20-year-old marketing student and an intern at the dealerships, works 20 to 30 hours per week for the stores while going to school full time. He runs the dealerships' social media presence, shoots photos of new and used vehicles in inventory for Mark Miller Subaru Midtown's website and organizes community-outreach events sponsored by the dealership. "Rather than being the errand boy, I really got to do my own projects and see my projects through," he said, citing a critical touchstone of job satisfaction among millennials, who generally are ages 18 to early 30s. Tatiana Miller says interns are hired with the intention of making them full time after graduation if positions are open, and paid accordingly. "The average employee makes about $50,000 at the company, so we really push for all staff to make $12 per hour or more, so we don't see a lot of drop-off in the lower levels," she said. Jeff Miller, a young general manager himself at age 34, says the focus on recruiting young workers has paid off handsomely: About 33 percent of new-car sales go to buyers ages 34 and younger, up from about 25 percent three years ago. "One of the biggest benefits is they're a lot more innovative and future-oriented. They're constantly looking at changing our practices," he said. "We're looking at evolving all of our processes to sell to millennials who are becoming a really big part of our business." For example, he said, the dealerships are overhauling their websites to enable customers to complete most of the vehicle transaction online -- from vehicle and options selection to price negotiation to putting down a deposit -- and at their own pace to minimize the time spent in one of the stores. The project is on track to launch this year, he said. "A millennial way of looking at it is that customers expect more these days," he said. "They expect you to have the quickest, most efficient process possible." He's also considering taking his dealerships' entire F&I process online, too, with digital menus of finance department products that customers can browse through and F&I managers working with customers via videoconferencing platforms such as Skype. The idea, the general manager said, is to complete as much of the transaction as possible online, without the sales pressure that repels younger buyers. Said Jeff Miller: "A millennial just loves that."